With us being well into spring now, I have started thinking more about summer fare including picnics and barbecues. A staple of both is your basic coleslaw that can be used either as a side or as a condiment in sandwiches. One of the great things about coleslaw is that the recipe is so easy to change and it just invites you to play around with it. I recently came across the concept of a blue cheese coleslaw and being the blue cheese fanatic that I am, I could not resist whipping up a batch. This cole slaw follows a pretty simple coleslaw recipe save for the addition of the crumbled blue cheese but one other nice addition is the grainy mustard which I have been really enjoying lately. The key to this blue cheese coleslaw is allowing it to have time to mellow so feel free to make it in the morning or even the day before. 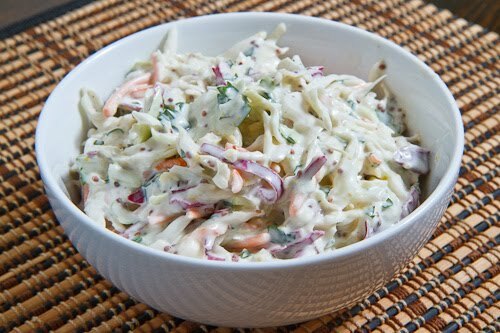 After letting the flavours mingle in the fridge for a while this coleslaw is truly amazing! It is just packed with flavour and the blue cheese gives it a really nice creaminess that will have you coming back for more. You can easily doubled this recipe and feel free to use a bag of pre-chopped cabbage to save a bit of time. Mix the cabbage and carrot in a large bowl. Mix the mayo, sour cream, mustard, lemon juice, salt and pepper, blue cheese and parsley in a bowl. Cover and let mellow in the fridge for a few hours. This blue cheese must really take it new heights. Love the creaminess. I LOVE BLUE Cheese in coleslaw, try adding apples, it rocks! I absolutely love creamy cole slaws versus the vinegar based ones. And the boyfriend LOVES blue cheese. This sounds delicious to make for summertime BBQs! Thanks for sharing the recipe and idea! I am not the biggest fan of coleslaw but I bet I'd like it better with blue cheese. I think this would also be nice with chopped apple mixed in. The best slaw I have ever had is Dead End BBQ's Red White and Blue slaw which uses blue cheese. I'm saving your version to try. I made cole slaw according to your recipe and had it last night with some barbecue chicken and it was great! My blue cheese was not very crumbly, so I ended up with bursts of blue cheese flavor in some bites – I liked it! Keep up your great blogging. I love this idea! I made it with buffalo sauce instead and added come celery to the coleslaw (also subbed plain yogurt for SC & mayo). It was amazing… I seriously ate this for dinner, midnight snack, breakfast, and lunch. Your blog is awesome, thanks! This was good but only after I added a some sweetener. It was a bit tart – sour. The sweetness brought out the flavors better. Thanks for the foundation though, Kevin.